Asia News Network commentators urge all concerned to find ways to resolve the complicated Rohingya issue to prevent the conflict from boiling over. Here are excerpts. Myanmar leader Aung San Suu Kyi's relative newness to governing is no excuse for failing to act swiftly to end the horrific conflict boiling over in western Rakhine state. The long political struggle she endured before coming to power should have taught her better than most that any military response to a political dispute is bound to fail or even worsen the situation. In the early hours of Friday last week, the Arakan Rohingya Salvation Army (Arsa) launched coordinated attacks on 30 police and army outposts in Rakhine. Equipped with homemade explosives, machetes and small arms, the militants attacked security forces in Maungdaw, Buthidaung and Rathedaung townships. The government said 10 police officers, a soldier and an immigration official were killed in the assault. The swift response by the Tatmadaw - the armed forces - left at least 77 insurgents dead (and one in custody). It would seem that the Tatmadaw took advantage of the situation to extend its "clearance" operations throughout the area. Clashes will continue and there is no end in sight to the communal strife between Muslims and Buddhists that has ignited violence repeatedly since 2012. Ms Suu Kyi characterised the Aug 25 attacks as an act of "terrorism" and urged news media to use the term "Bengali terrorists" rather than "Muslim insurgents". It was a reversal of her directive last year that, to avoid inflaming ethnic tensions, the stateless people of Rakhine should be referred to as "Muslims" rather than "Bengalis" or "Rohingya". The sharp edge of her dilemma is the Tatmadaw, which continues to wield substantial power despite having relinquished some of the reins of government in an election. The armed forces believe in an eye for an eye and a tooth for a tooth and will show the Rohingya militants no mercy. Former United Nations chief Kofi Annan, a fellow Nobel Prize laureate of Ms Suu Kyi, released his advisory committee's report just days before the bedlam on Aug 25. The government received it with gratitude. 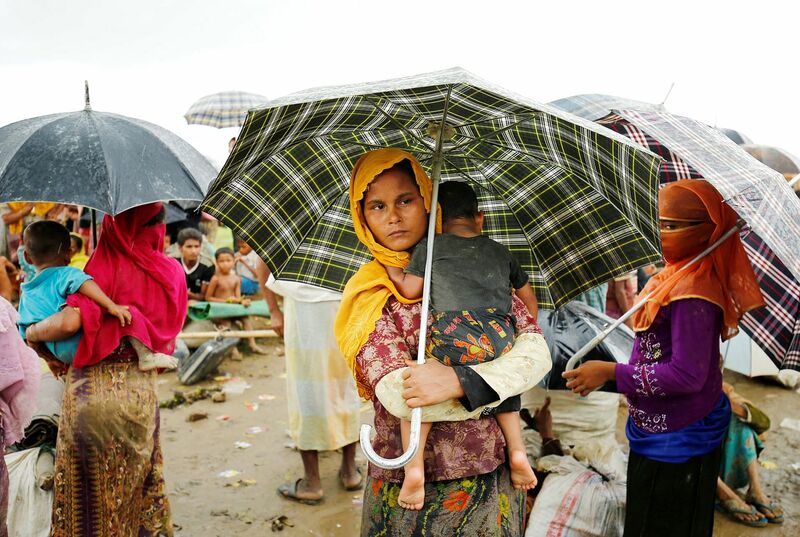 Some members of the government might well be willing to heed its recommendations and grant the Rohingya their overdue rights, enabling them to access medical care and other state services. The Tatmadaw is unwilling to bend, however, and with the three ministries of Defence, Home Affairs and Border Affairs under its control, it still has Ms Suu Kyi on its reins, if not the government per se. She is going to have to reverse that situation now. The Pope has been a vocal advocate of the rights of the Rohingya people in Myanmar. His visit to the restive nation (due to take place later this year) comes at a time when the government has made up its mind to purge the Bengali-speaking refugees from their native Rakhine state in the Buddhist-majority nation. Shorn of the diplomatic grandstanding that has been reserved for the Pope in Myanmar, there are profound implications of the first papal visit to the predominantly Buddhist nation that has over the past few days been convulsed by renewed persecution of the Rohingya Muslims. The minority segment on the border with Bangladesh has been buffeted from shore to shore in search of a home. The papacy has been a vocal critic of Myanmar's harsh treatment of the Rohingya or "nowhere men", and the purported transition to democracy a little less than two years ago has done but little to assuage their suffering. The visit of Pope Francis comes at a particularly volatile juncture for Myanmar. On Sunday, the Pope again condemned "the persecution of our Rohingya brothers" and called on "men and women of good faith to help them and ensure their full rights". Like his previous interventions, the comments are likely to infuriate nationalists who maintain that the Rohingya are not Myanmar people but rather Bangladeshis with no right to live in the country. Seldom have human rights and the certitudes of international law been so flagrantly violated. Small wonder that the dispensation in Naypyitaw is more than a little puzzled, if not a mite embarrassed as well, over the Pope's visit. Not to put too fine a point on it, the intriguing silence of Ms Aung San Suu Kyi - the de facto head of the country - is testament to her failure to address a humanitarian issue. As her dilemma becomes increasingly uncomfortable, she is caught between religious nationalists and the still powerful military, which had ruled for decades prior to the watershed elections in November 2015, and Western donors and human rights organisations at another remove. The latter, most particularly, have been critical of her failure to end ethnic strife and implement reforms. The latest confrontation between the security forces and militants of the self-styled Arakan Rohingya Salvation Army in Rakhine was reportedly the most lethal in recent memory, leaving more than 100 people dead. No less crucially, the violence has led to the evacuation of non-Muslims. The hope of a democratic renaissance that greeted Ms Suu Kyi's assumption of power early last year is now in tatters. It is Myanmar's tragedy that the inherent fragility of its democracy has been exposed. The fact of the matter is that the military remains ever so omnipotent, confident of the support of the Buddhist nationalists. The descent of the "dove" at Naypyitaw airport cannot but be unnerving for the ruthless establishment. Ms Suu Kyi has failed to keep her distance from the soldier. The very fact that Myanmar has blamed "extremist Bengali insurgents" for the Aug 25 militant attack on its security forces underlines the crux of the problem in Rakhine state. It restates that the Aung San Suu Kyi government refuses to accept the indigenous Muslim minority for what they are. The Rohingya are as Bengali as Americans are English. This attitude of rejecting one of its own has underpinned Myanmar's policy on the Rohingya. The Rohingya have been living in Rakhine for centuries. Regrettably, with one stroke of the pen this minority group, an integral part of the Burmese culture and society, was made stateless by the Burmese strongman, General Ne Win. That was his reaction to his abortive attempt to force the Rohingya out of the western province into Bangladesh permanently. He managed to push out nearly one-third, or 300,000, of the total Rohingya with a military operation code-named "Operation King Dragon", ostensibly for the purpose of checking illegal immigrants, in 1978. But strong international reaction against the ethnic purge forced him to take back most of those from Bangladesh. That policy of expulsion having failed, he resorted to a legal expedient - the Citizenship Law of 1982. The latest extremist attack of Aug 25, which merits the strongest contempt, is also a cause for concern for Bangladesh. It was the killing of several Myanmar security personnel by militants that triggered the violence wreaked on the Rohingya in the name of fighting insurgency in October last year. That action came in for criticism from the local head of the United Nations refugee agency, who went so far as to characterise the military's action as ethnic cleansing. Bangladesh now faces a Catch-22 situation. On the one hand, it cannot officially open its doors to the persecuted Rohingya, but neither can it forcefully turn them back into the teeth of violence and uncertainty. Strategic compulsions preclude the former option, since it would encourage the Myanmar government to continue to create conditions to lever all the Rohingya permanently out of their homeland, and fulfil its longstanding aim. But hosting a large number of refugees will impose - and it already has - adverse security and socio-economic consequences on Bangladesh. Amid all the killings in one part of her country, the silence of Ms Suu Kyi has been deafening. Her response to atrocities committed by her security forces was that they were working as per "the law". A redeeming feature in the entire situation was the setting up of the (Kofi) Annan Commission in August last year to "find a sustainable solution on the complicated issues in Rakhine State". If this was not merely a ruse by Ms Suu Kyi to placate international opinion, then her government should recognise the merit of the Commission's recommendations, which were delivered on Aug 24, and act on them. It is time that Myanmar realise the error of its Rohingya policy. If anything, it has fostered extremism among the younger members of the Rohingya community. This cannot be allowed to happen. If this conflict is allowed to simmer, Bangladesh would suffer the fallout in equal measure. The View From Asia is a compilation of articles from The Straits Times' media partner, Asia News Network, a grouping of 23 news media entities.